Feel like you're in the mighty jungle as you drink and dine with animals from the wild. (SPOT.ph) If you’re on the hunt for the cutest café in town, the quest might just be over—if you’re an animal lover, that is. Stepping inside Zoo Coffee feels like you’ve been transported to an animal sanctuary in the middle of the city. Here, you’ll see a life-sized toy giraffe and tiger lazing around by the doorway, and toy snakes and monkeys swinging from the ceiling. You can even sip your drinks casually beside a giant stuffed gorilla chilling in one of the seats. 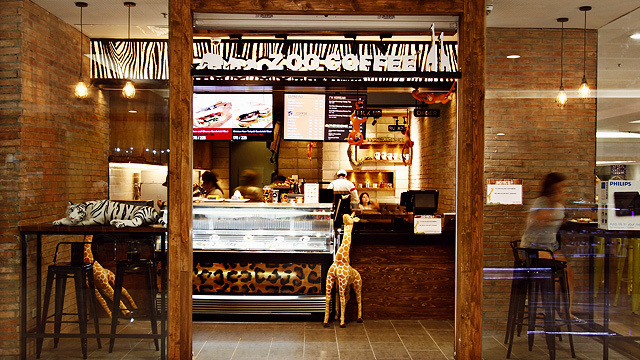 Meanwhile, the café’s friendly staff are dressed in safari outfits to make sure you have a roaring good time. 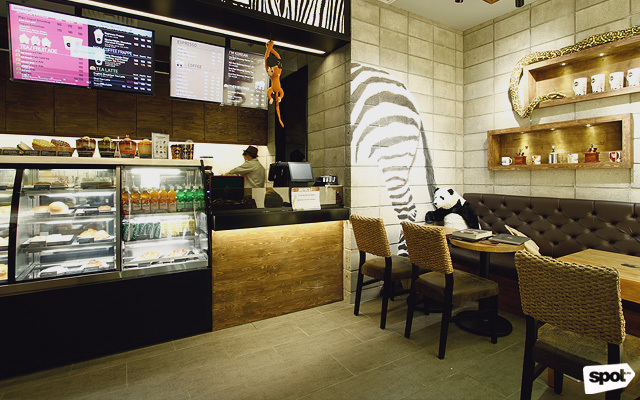 The animal-themed café is a well-known coffee chain in Korea. 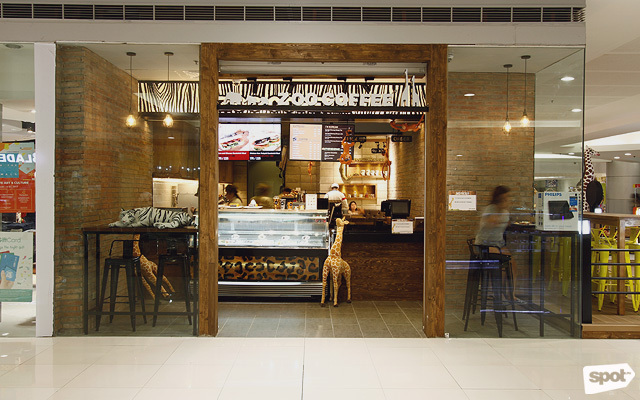 When Zoo Coffee Philippines owner Katrina Balonan and her family went to Korea, they were so impressed by Zoo Coffee’s enjoyable vibe and delicious food that they decided to bring the concept to the Philippines. 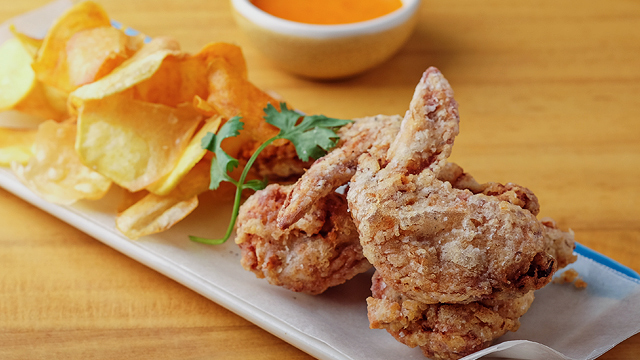 The café, along with their first branch in Makati, is closely patterned after the Zoo Coffee shops in Korea, from the menu down to the interiors. To help maintain its authenticity and quality, their Korean business partners come to the Philippines quarterly to conduct inspections and offer suggestions on how to improve the standards of the café’s food and services. “With the opening of Zoo Coffee in the Philippines, we try to bring something new to the market,” says Katrina. 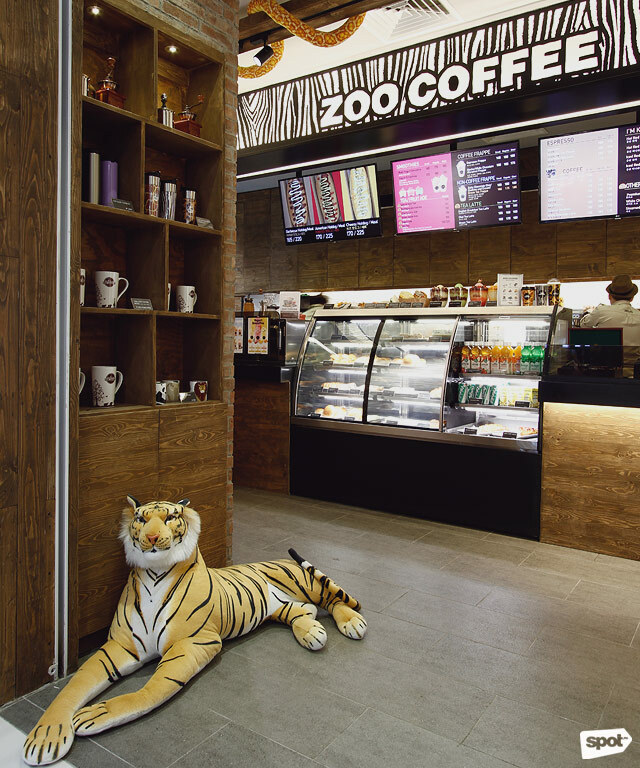 “Most coffee shops have a really formal ambience, but for Zoo Coffee, we were hoping to make it stand out by putting a fun aspect to it.” True enough, the café’s jungle motif gives the place a joyful atmosphere. In fact, the wall showing a silhouette of a giraffe, the zebra patterns on the counter, and the leopard print on the gelato bar make customers feel they’re in the wild. The cups, as well as souvenir items on display such as tumblers and mugs, are also decorated with animal prints. And of course, the cuddly creatures in the café—these huge animal dolls—make the place even more charming, relaxing, and eye-catching for both children and adults. 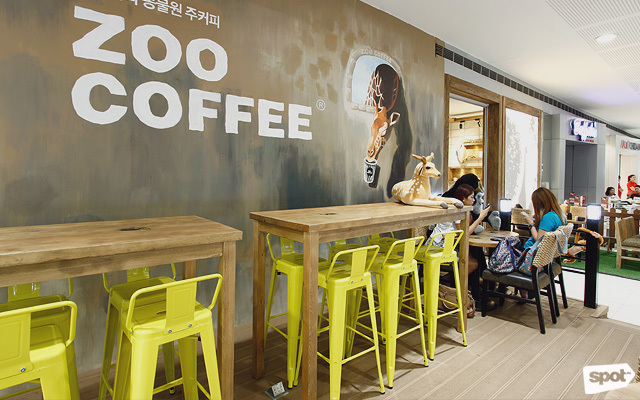 With their unique and darling décor, Zoo Coffee will make your hang outs more interesting. Their food and drinks are just as IG-worthy as the café’s interiors, too. The Caramel Frappe (P150/small, P165/regular, P175/giant) is a sweet and creamy cool drink. Plus, if you like your coffee strong, this drink delivers. Made with coffee and fresh milk then drizzled with caramel sauce and whipped cream, you can’t go wrong with this crowd favorite. Zoo Coffee also offers tasty grub for those who need a quick bite. What could be more comforting than a simple hotdog sandwich? 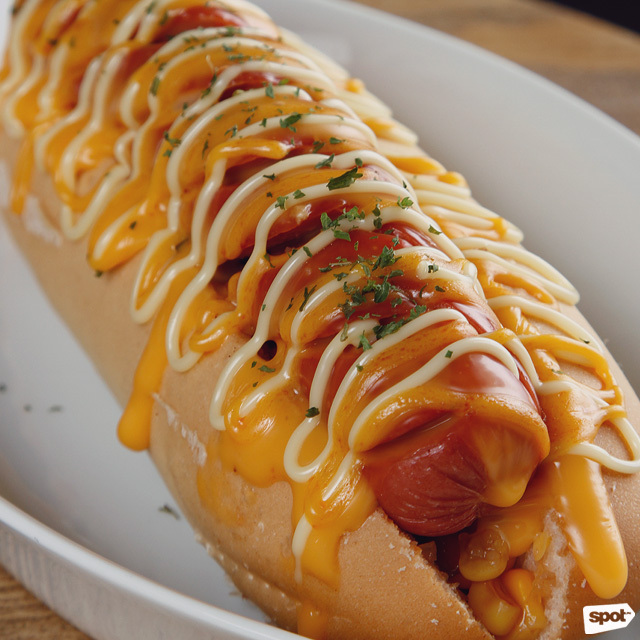 Chow down on the Cheesy Hotdog (P170, P225/meal), a classic snack made special with a splash of their special cheesy sauce, sprinkled with corn kernels and pickles, and served in a warm, fresh bun. 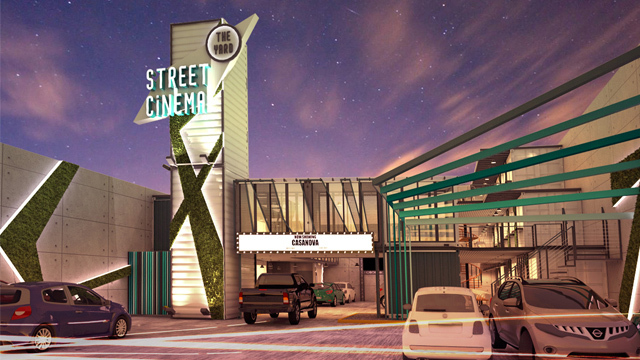 It’s something that will be loved by kids and kids-at-heart! 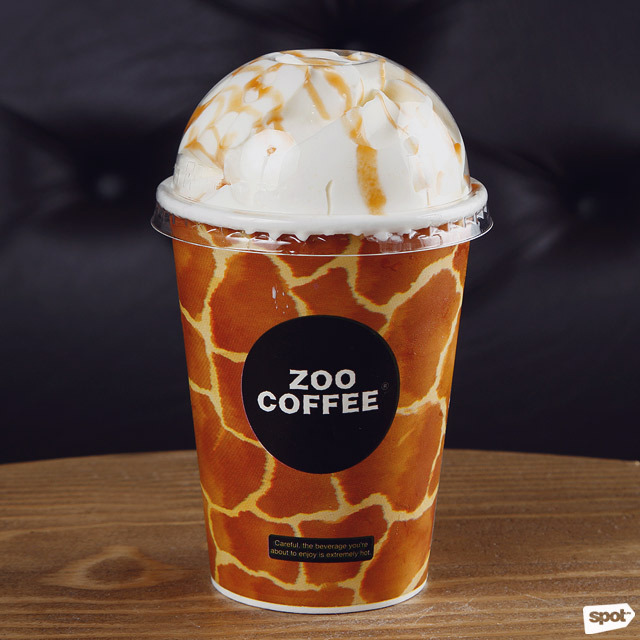 Meanwhile, Zoo Coffee may be rooted in Korea, but it has the Filipino foodies in mind—and Filipinos love three things: Sweets, mangoes, and big servings. 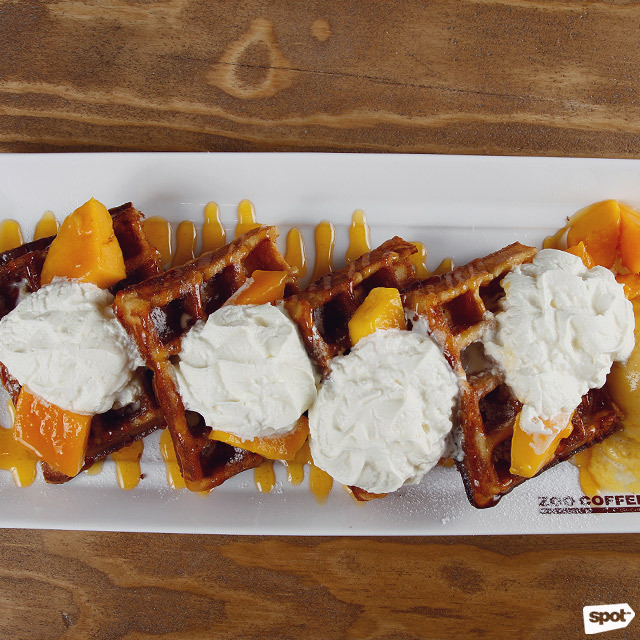 The Mango Waffle (P190) covers all the bases. 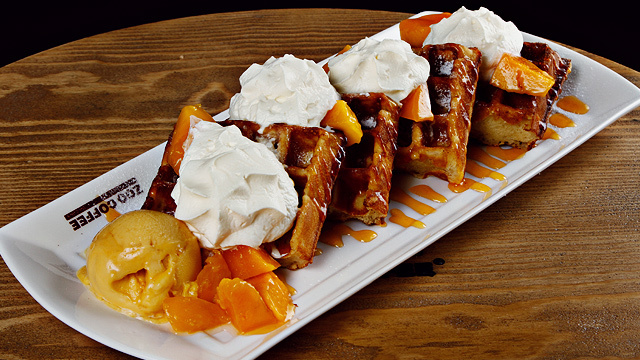 The huge platter of four light and fluffy waffles topped with fresh mangoes, gobs of whipped cream, and a scoop of mango gelato, is guaranteed to make your mouth water. For a sweet treat that’s overflowing with creamy and fruity goodness, your Zoo Coffee journey wouldn't be complete without an order of their Double Berry Bingsu (P285). One look at its humongous bowl will render you speechless. Your first thought might be “That’s huge! Can I really eat all of that? 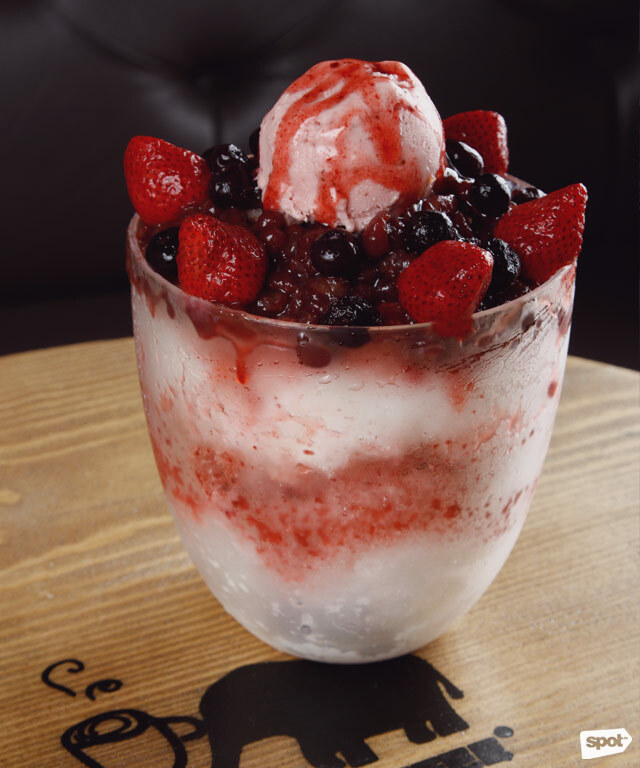 !” But a spoonful of its milky and fine ice shavings paired with fresh strawberries and blueberries, red beans, and the café’s homemade milk tea concentrate will make you want to finish every drop. If you still can’t get enough of the sweet stuff, Zoo Coffee also has a gelato bar where you can beat the heat with their yummy frozen treats. They offer an assortment of flavors including vanilla, green tea, black sesame, blueberry yogurt, strawberry, mango sorbet, peanut butter and jelly, chocolate, and caramel. Vivaciously colorful food, cool drinks, and fun interiors—how could you not go, "hakuna matata"?